The Argentine novelist Juan José Saer was born to Syrian immigrants in 1937 and lived most of his young life in the city of Santa Fe. In 1968, Saer, at the time a philosophy student and lecturer on the history of cinema, left Argentina for Paris, only returning to the country sporadically until his death in 2005. Like many other Latin American writers of his generation, Saer lived in France as an exile; for him, a return to his native country during the years of dictatorship would’ve been lethal. 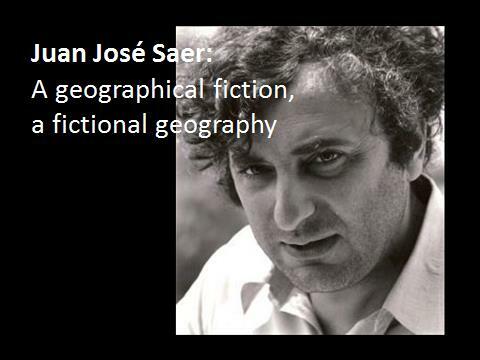 Despite his long exile, though, Saer made the city of Santa Fe the central topic of his fiction. Saer placed his memory of Santa Fe at the center of his writing. He made the memory of a geography, its textures, contours, and decay, the subject of his fiction. Almost all of Saer’s work concerns, in some way, the city of Santa Fe. His intensely sustained, at times almost pathological attention to a geographical space is remarkable; no other Latin American novelist, to my knowledge, has produced such a singular and expansive body of work about a single place. 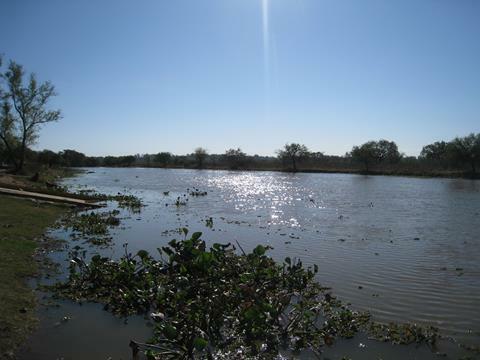 And one feature of this place, the Paraná River, was of most interest to Saer. The city of Santa Fe is located in what is known to ecologists as a littoral region, a low-lying topography run through with water channels and lagoons. (The Mississippi River delta is one such littoral.) 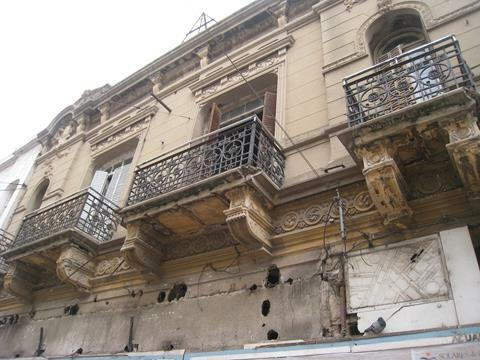 Among Argentines, and in Saer’s fiction in particular, the region is known simply as el litoral. 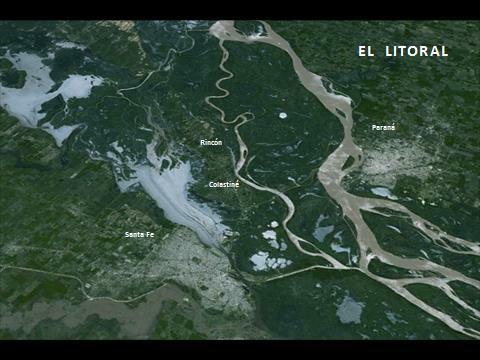 I mention all of this because the shape of the land in the littoral is in perpetual flux, continuously and profoundly reshaped by the fluvial pressures of the river. One day, after a flood, a river island where you once camped simply disappears, as though it never existed. The littoral region, el litoral—with its intricate channels, its false depths, and its visible entropy—is the topography most closely analogous to memory. What Saer’s fiction offers us is not the nostalgic wound of the exile, but rather a sustained critique of the verisimilitude of memory, of its mimetic capacity. And this critique is especially poignant in Argentina, where the often-problematic recovery of post-traumatic memory has been a national project since the end of the dictatorship in 1983. For the past four years, I’ve been translating a group of novels by Juan José Saer, the first of which was Glosa, or gloss, which follows two characters along a twenty-one-block walk down the street pictured above, La Avenida San Martín. 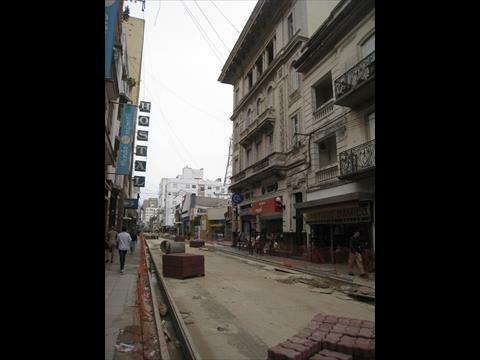 When I arrived in Santa Fe in the summer of 2012, the pedestrian section of San Martín was expanding north. I’d arrived about six months too late to see for myself the street as it had been. The passage of time, or what Cervantes in the Exemplary Novels prophetically calls el discurso del tiempo, had literally erased it from the face of the earth. But of course my hope was false. 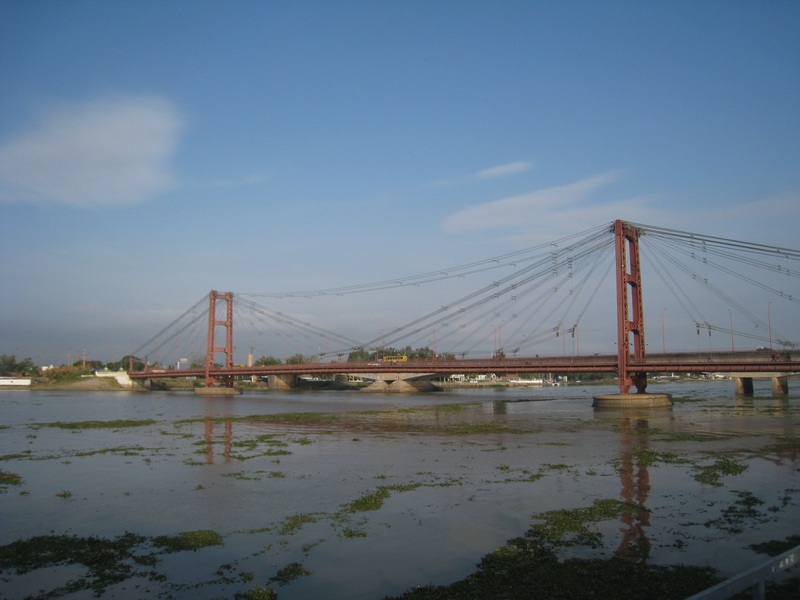 San Martín had surely been paved over repeatedly, even by the time Glosa was published in 1986. Saer wasn’t describing a specific place, but rather a specified memory of a place. Like most old cities, especially the tropical variety, Santa Fe was peeling somewhat at the edges, exposing curious sedimentations of old and new. In this image, a set of postcolonial balconies weighs heavily on a crumbling, art deco facade while a pigeon, nesting between the layers of history, stares disdainfully at my camera. Even after realizing that Saer’s representation of memory was in fact as fiction, I still sought out things that may have been unchanged in the late sixties. This boutique, signaling European fashion, seemed like a good candidate. Did Saer walk past this same neon sign in 1967 and imagine a transatlantic life far from this provincial backwater? The original purpose of my trip was to visit the city’s municipal archives, to see how Saer’s representation of this place differed from its material history. I hoped that the photographs in the archive would serve as a counterpoint to his fiction. But what I found on the streets was just as compelling. 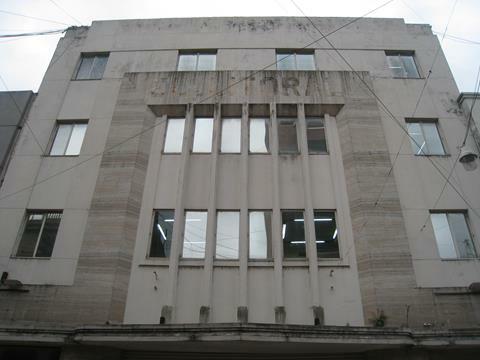 Above, we see the old headquarters of the regional newspaper El diario del Litoral, or simply El Litoral, a place frequently represented in Saer’s novels. Though the newspaper changed location years ago, this building still carries the faint trace of its presence in the stain left behind by the newspaper’s name. But, like a footprint, this index only exists as an absence; it is only visible because of what’s not there. Seeing these negative traces everywhere, I began to think that the problematic of Saer’s novels wasn’t just the fiction of memory, but something much more subtle. 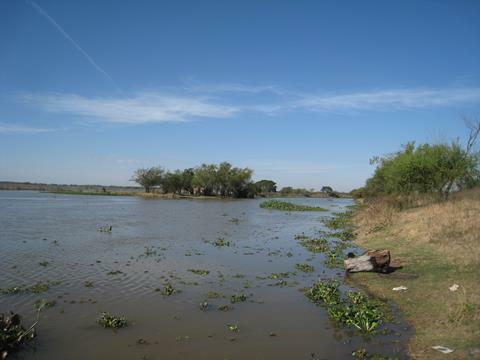 In the opening scene of Saer’s posthumous novel, La Grande, the protagonist, Gutiérrez, takes a walk with Nula, his wine salesman, southwest along a branch of the Paraná river, from the town of Rincón to the town of Colastiné. It’s the late nineties, and Gutiérrez, a screenwriter, has recently returned to the region after more than thirty years living in Europe; Nula, the grandson of Syrian immigrants, moonlights as a philosopher. Even a casual reader of Saer will recognize, in Nula and Gutiérrez, two moments in the life of the author. When I first read this scene, the juxtaposition of two biographical moments seemed like just another wink from Saer. But, when I tried to recreate a section of their walk, I realized that there was something different happening. One afternoon—probably the most beautiful day of my six weeks in the country—my wife and I and three Saer scholars crammed into a tiny sedan and drove out to Colastiné. We spent the entire thirty-minute trip arguing over where the things Saer said had happened, had really happened. Eventually, we ended up on the levee that surrounds the town, just visible in the right side of the image above. Everyone waited politely while I “had a moment” with the place, which I’d felt so intimate with for so long and from so far away. When we continued into Colastiné, we started discussing the opening scene of La Grande, and it was at this moment that I made the most important discovery of the trip. Someone in the car, and I don’t remember now who it was, casually mentioned that the walk taken by Gutiérrez and Nula was impossible. The levee had been built in the eighties, after a major flood, and their walk into the town would have necessarily followed its course, but it didn’t. In fact, their walk followed a path that had been erased by the river in the sixties. From any other writer, this anachronism could’ve been a simple oversight, or a fictionalization of the landscape, but from Saer, whose meticulous attention to the details of the local geography was, as I’ve said, almost pathological, it had to be something else. I left Argentina with this one completely new idea: That during their walk, and due to the sheer force of Gutiérrez’s memory, the landscape had literally changed shape around them. Thirty years of sediment suddenly shifted, though incompletely, and the two men were able to walk from one layer of time into another. Steve Dolph is a doctoral student in Spanish at the University of Pennsylvania, and the translator of three novels by Juan José Saer: The Sixty-Five Years of Washington, Scars, and La Grande (forthcoming), all published by Open Letter Books. An extract from La Grande was published in The Massachusetts Review, Volume 52, Issues 3/4. Other thoughts on the topology of memory in La Grande are available here. 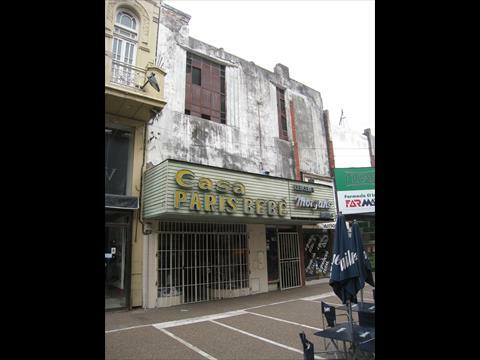 This entry was posted on February 2, 2014 by nb in argentina, essay, photo, spanish.